This radio facility is located on a peak in the Papoose Mountain Range, only a few miles southwest of Area 51, and almost certainly connected to it. Not much is known about this facility. On some maps it is marked as a microwave relay facility. Just like Area 51, it is not marked in the official Nellis Range Chart or in any of the USGS maps. One of the digitally encrypted trunking sites of the new Area 51 security radio system is located here. The above photo was taken from Tikaboo Peak in August 2005. As you can see the entire top of the mountain has been scraped and leveled to form a plateau. Near the northern (right) edge of the plateau are several buildings and what looks like an antenna tower. On the left is a large boxy structure. It appears that the bottom is a solid building, with some sort of scaffolding towering over it. There does not seem to be much change compared to photos taken of the site in 2001. The facility can not be seen from Tikaboo Valley. However, it can be seen from various elevated locations, like the Powerlines Overlook, and of course from Tikaboo Peak. 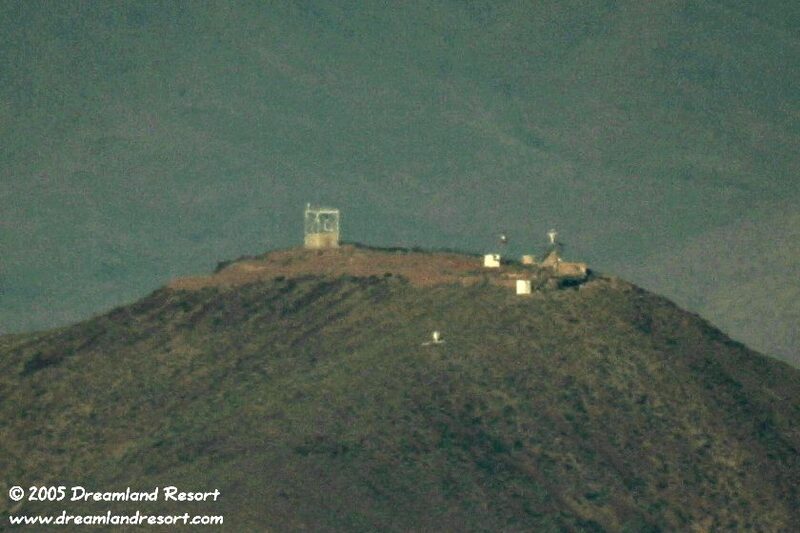 It is hard to spot during the day, but at night it can easily be located by the lights on the antenna tower. There is a constant white light, and a red light above it. The GPS coordinates of the tall structure on the left are: N 37° 12.312' and W 115° 50.432'.